The star is the coolest and smallest to give off a rare white-light superflare, and by some definitions could be too small be considered a star. The discovery, funded by the Science and Technology Facilities Council, is published in the Monthly Notices of the Royal Astronomical Society: Letters as the version of record today (17 April) and sheds light on the question of how small a star can be and still display flaring activity in its atmosphere. Flares are thought to be driven by a sudden release of magnetic energy generated in the star's interior. This causes charged particles to heat plasma on the stellar surface, releasing vast amounts of optical, UV and X-ray radiation. 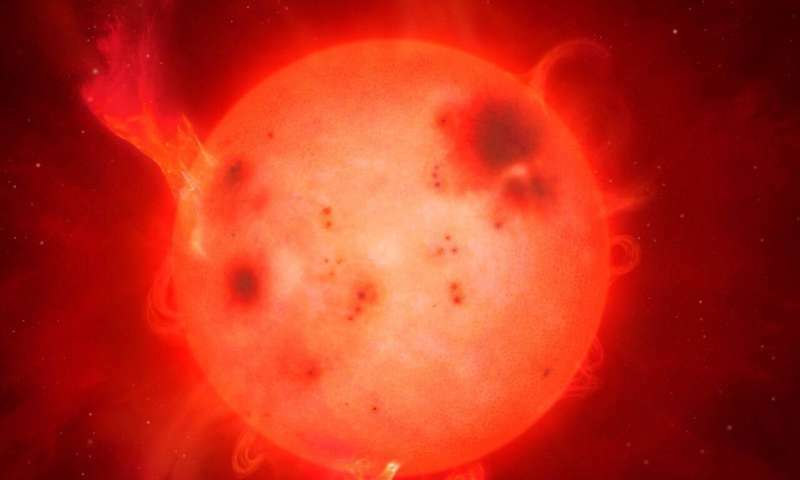 Lead author James Jackman, a Ph.D. student in the University of Warwick's Department of Physics, said: "The activity of low mass stars decreases as you go to lower and lower masses and we expect the chromosphere (a region of the star which support flares) to get cooler or weaker. The fact that we've observed this incredibly low mass star, where the chromosphere should be almost at its weakest, but we have a white-light flare occurring shows that strong magnetic activity can still persist down to this level. "It's right on the boundary between being a star and a brown dwarf, a very low mass, substellar object. Any lower in mass and it would definitely be a brown dwarf. By pushing this boundary we can see whether these type of flares are limited to stars and if so, when does this activity stop? This result takes us a long way to answering these questions." The L dwarf star located 250 light years away, named ULAS J224940.13-011236.9, is only a tenth of the radius of our own sun, almost the same size as Jupiter in our solar system. It was too faint for most telescopes to observe until the researchers, led by the University of Warwick, spotted the massive stellar explosion in its chromosphere in an optical survey of the surrounding stars. Using the Next Generation Transit Survey (NGTS) facility at the European Southern Observatory's Paranal Observatory, with additional data from the Two Micron All Sky Survey (2MASS) and Wide-field Infrared Survey Explorer (WISE), they observed the brightness of the star over 146 nights. The flare occurred on the night of 13 August 2017 and gave off energy equivalent to 80 billion megatonnes of TNT, ten times as much energy as the Carrington event in 1859, the highest energy event observed on our sun. Solar flares occur on our Sun on a regular basis, but if the Sun were to superflare like this star the Earth's communications and energy systems could be at serious risk of failing. It is one of the largest flares ever seen on an L dwarf star, making the star appear 10,000 times brighter than normal. James adds: "We knew from other surveys that this kind of star was there and we knew from previous work that these kinds of stars can show incredible flares. However, the quiescent star was too faint for our telescopes to see normally – we wouldn't receive enough light for the star to appear above the background from the sky. Only when it flared did it become bright enough for us to detect it with our telescopes." James's Ph.D. supervisor Professor Peter Wheatley said: "Our twelve NGTS telescopes are normally used to search for planets around bright stars, so it is exciting to find that we can also use them to find giant explosions on tiny, faint stars. It is particularly pleasing that detecting these flares may help us to understand the origin of life on planets." L dwarfs are among the lowest mass objects that could still be considered to be a star, lying in the transition region between stars and brown dwarfs. Brown dwarfs are not massive enough to fuse hydrogen into helium as stars do. L dwarfs are also very cool compared to the more common main sequence stars, such as red dwarfs, and emit radiation mostly in the infra-red, which may affect their ability to support the creation of life. James adds: "Hotter stars will emit more in the optical spectrum, especially towards the UV. Because this star is cooler, around 2000 kelvin, and most of its light is towards the infra-red, when it flares you get a burst of UV radiation that you wouldn't normally see. "To get chemical reactions going on any orbiting planets and to form amino acids that form the basis of life, you would need a certain level of UV radiation. These stars don't normally have that because they emit mostly in the infra-red. But if they produced a large flare such as this one that might kickstart some reactions." Professor Wheatley adds: "It is amazing that such a puny star can produce such a powerful explosion. This discovery is going to force us to think again about how small stars can store energy in magnetic fields. We are now searching giant flares from other tiny stars and push the limits on our understanding of stellar activity." Supplied link is pay-walled beyond abstract. Note they quote photometric distance as 76 +8−7pc, so ~~250 LY. If the Sun were to have such an explosive event, we had better hope we are underground. This does coincide with the Earth Catastrophe Cycle which the Suspicious Observers community has been expoundingupon for sometime now. Tahnks for the link Nik_2213. I'm wondering whether we shouldn't see huge flares on stars that are right at the borderline mass for fusion to be possible. Fusin starts up -> matter gets pushed outwards by the radiation pressure until conditions no longer support it -> matter starts falling inwards -> whabamm. The inertia of the infalling mass should cause an initial fusion reaction peak much in excess of what you would get if you just have a 'steady state' star. ...or maybe just something crashed into that star. Lol! Suspicious observers! That is the crank and con-artist Ben Davidson, is it not? Making you a duped consensus stooge. Some people generate original thoughts, you obviously are incapable. Crank worshiper breaks cover. This thread is probably worth marking. He's an unqualified crank. No science qualifications whatsoever. A lawyer by training. Probably why he finds it so easy to con gullible fools such as yourself.